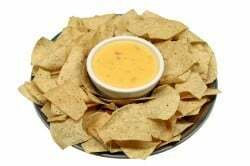 This is a simple to prepare Queso dip, that you are sure to enjoy ! If you can find Land Of Lakes processed American cheese, I think you will find it to be the closest. Make Pappasitos queso at home. Melt cheese with milk and stir until blended. Add chilies with liquid, garlic, onion, and stir until onions and transparent. Remove from heat and add tomatoes before serving. Stephanie, this is great. However it is missing a few ingredients. I used to work there so I can confirm the Land ‘O Lakes cheese. It is definitely the brand they use. However, when they serve it, not only do they top it with tomatoes but they also put cilantro and some kind of cheese (it looks like feta-with that consistency). Any way to find out what that cheese is they top it with? This recipe is absolutely IDENTICAL to the real thing! I am in LOVE!!!!!! What brand of processed cheese did you use? I used Kroger, I have also used HEB brand. I can’t remember the brand name but it was at the deli counter at walmart. Sigh…where do I find processed cheese that’s not Velveeta?!? Any store sells it, just pick up the store brand. Matt, the cheese is Land ‘O Lakes processed cheese (yellow american). Walmart is the only store that I know of that sells it at the deli counter. It is difficult if not impossible to find in other parts of the store, and all the other stores I called did not carry that brand. I go there and ask them to cut it at a “14” which is about an inch or inch and a half thick. Then when I go home I slice it up into cubes to make it easier to melt. It’s not expensive-like $6 per pound. We went to find some White American processed cheese and you can find it at any walmart deli. But just be warned it is very expensive so you may be better off just going to your local mexican restaraunt and buy there premade stuff.